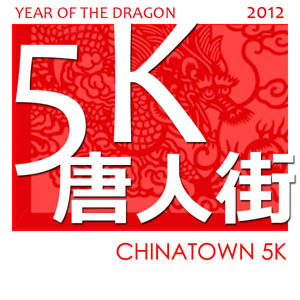 The Chicago Chinatown 5K will always hold a special place in my heart. It is the first race I ran post-transformation, and it was the springboard for my running obsession — one that never seems to let up. The 2012 edition was my third running and it has been fun to see the same faces come out, not to mention the joy of watching my finishing times drop from 24 minutes to 21 minutes to 19 minutes. This race is always hot. It’s in July, and there’s little shade along the course. But I showed up perky as could be, ready to do a little speedwork. I park the car at my office on South Michigan and run a 20 minute warm-up to the start line. It has been a year since I last ran a 5K, but I do remember the importance of a warm-up. If I’m going to start hard at the beginning, the legs need to be ready. I haven’t tapered for this. I’m just doing it for fun. In fact, for the week, I’ve already run over 40 miles so I’m not sure there’s much steam left in the engine, but I do want to go hard and see what happens. My mind thinks I can get done in the 18:30 range, and as I slowly churn the legs, priming them for a hard effort, it seems they aren’t so sure. It’s warm. 80-something degrees. There are no clouds in sight. At the start line, I look around and can’t help but think snobbish thoughts (when did I become a running snob?). Is a 60 oz. Camelback really necessary for a 5K?, I wonder as I count three of them in the crowd of 500+ runners. And what’s with all the Nip Guards? How long do these guys plan to be out there? But to me, the most hilarious thing is being pushed out of the way by some, er, “bigger” runners who feel they need to be right at the front when the gun goes off. The starting chute is already narrow enough, I don’t see how blocking the faster guys who are going to run them over anyway is going to make their race experience any better. I’m chalking it up to inexperience. Thankfully, some race official with a megaphone instructs those out-of-place runners to move to the back. We’re off. I’m through the chute, fighting my way past a few ambitious 12-year-olds and a slew of overzealous adults. We fly east down Archer, take a sharp right turn on Wentworth and head towards Old Chinatown. I already know, from years past, that the Old Chinatown section is the worst part of this race. In fact, in my training runs that take me through Chinatown, I make sure to always avoid the old section on Wentworth. I love Chinese food and all, but when red-lining, the toxic combination of Chinese food + garbage + old men chain-smoking on the street is just lethal. Sure enough, my nose is hit with the aforementioned poisonous waft and I do what I can to breathe through my mouth so I don’t die. Just off to my right, it sounds like someone else is dying. I look behind me and it’s a little kid. Couldn’t be more than 10 years old or so, yet he’s sticking with me at 6 minute pace. He’s huffing and puffing and struggling and coughing. Maybe you should slow down a little, I offer. He takes off, past me. But he doesn’t get far before he just stops. Completely. And now I’m already halfway done! I hit the turnaround aid station just north of Sox Park on Wentworth. I’m going too fast to drink anything, so I just dump all the water I can on my head. It helps. Barely. I try to run along the tiny bit of shade that the highway barrier offers there, but so are most runners, so as it crowds, I just hop back in the sunlight. I’m almost done anyway. I hit the 2-mile mark and the clock says 12:00 exactly. Damn. I’m doing pretty good, I think to myself. So I start calculating in my head and start thinking about how this will end up being a great race for me and how much I’m going to brag to my old man about it and then, I’m back in Old Chinatown, struggling to not puke from the food/garbage/second-hand smoke onslaught. Just before I reach the turn on Archer to head for the finish line I look at my watch and see I’m at 19 minutes and change. Oh well. I sprint through the finish line at 19:47 — not terribly excited but not terribly disappointed either. As I grab some water and a banana, I think my lack of concentration towards the end is what slowed me down. But I’m not gonna dwell on it. I ran sub-20, bettered my time from the year before and I have to get in the car to meet my ultra buddies for a whole day of running yet anyway. This was just a warm-up. This entry was posted on July 15, 2012 by therunfactoryblog. It was filed under Philosophy, Race Reports, Training and was tagged with 5K, Chinatown 5K, Race pace, Race Reports, Speed Work. Great time – I would have fared very poorly in such conditions. It’s cool that you’ve stuck with this race despite having a predilection for super long distances. In my case though, I don’t like 5ks. They hurt from the very beginning and it just feels like you’re killing yourself by the start of mile 2. To make matters worse, up until this past June, every single 5k I had ever run was faster than the one before it, so I had that additional pressure every time I toed the line. Fortunately that streak ended, so I can race in peace. But still, it burns! It does burn, that’s for sure. I feel like doing them every once in a while is a good reminder of why I prefer the long stuff.